Finally, my BOOK is out! In the States, I can safely say that one of the cheapest if not the cheapest cooked food item one can buy is rotisserie chicken. It is available every single day in every supermarket. For $4.99, you have a complete meal. it doesn’t have to be boring either because you can easily transform it into many other dishes within a few minutes. I used to buy fried breaded chicken by the piece. You could get drumstick, chicken wings, or chicken breast. And it is cheap, too. I eat it as is with plain white rice. Coupled with coleslow, it makes a satisfying lunch or dinner. With the leftovers, I turn it into chicken adobo, kare kare, sinigang, curry chicken, or even chicken pot pie. Oftentimes, I would saute some garlic, add in the chicken, some broth and I would have misua soup or chicken macaroni soup. There was a time when a house repairman knocked on our apartment, and I was distinctly elated when he remarked “that’s the best smelling food that greeted me this morning.” His compliment definitely made my day! The versatility of roast chicken is endless. You can turn it into chicken sandwich, use it to garnish a green salad, turn it into empanadas, or steamed bun. It saves time and children love it. In spite of my early exposure to Mama’s cooking, I didn’t develop sufficient confidence in it until much later in life. I always felt insecure about the quality of my home cooking and for a long time, the standard against which I based my score was always that of my mom’s. Cooking for a small nuclear family like mine was a lot different from cooking for a big brood. Eventually, though, I realized that this self-imposed limitation was crazy. I realized that cooking was more a creative endeavor rather than a fixed science. Gradually I was able to develop a “think the taste” approach to cooking. During tight periods in the family’s budget, I turned to the educational television program “Tele-Aralan Ng Kakayahan” of Cecilia Garrucho for recipes that were cheap, nutritious, and delicious. One didn’t need to spend much to be able to come up with good meals. I learned to cook mock hamburger by using chopped “puso ng saging” or heart of bananas instead of the more expensive ground beef mixed with the usual chopped onion, flour, and egg. My children thought they tasted better than real hamburgers. Egg rolls were prepared by mixing just a little amount of ground pork mixed with lots of minced turnips and onion. Decreasing the amount of meat and using more veggies not only resulted in cheaper meals but also provided a more healthful diet for the family. One interesting discovery was that of coming up with cherry red juice by boiling “talbos ng kamote” or sweet potato tops in water and then putting in squeezed calamansi (lemon) and sugar. And as I cooked more, I became more versatile and gradually developed the confidence that yes, I can cook and cook well. Full time wife and mother – Lydia didn’t realize it but forty years have slipped by so fast. Her two daughters have left home and country and formed their own families. And now she faces a wide open horizon, will she dare dream again? First she had to recoup her sense of who she is. At a young age of twenty-five, she left a promising career to focus exclusively on her family. It was a solitary path, one rarely chosen by many, but one she believed firmly in. Going without domestic help, she plunged headlong into motherhood. It would have been nice to have some domestic help but this would have given her nothing much to do. So foregoing this luxury, she discovered a new world of fulltime motherhood, reveled in it, single-handedly embraced its challenges, its demands and its joys. Many could not understand this. A friend asked “don’t you get bored?” Lydia’s answer “This is learning one can never have any other way. To give birth, to see a new being emerge from you, to witness its fragility and at the same time its huge potential, and to know that you have been entrusted with a divine task to help shape the person this baby would ultimately become. What greater task is there?” “Every day is a learning experience. As this child grows, I grow alongside it.” Awesome! Amazing! Finally, my BOOK is out! Yehey! Set in the sixties and the seventies, amidst the colorful environs of downtown Avenida Rizal in Manila, the canvas of life revolves around the Ong family and weaves us through the scenes of school, wet market, kitchen, home, and neighborhood. Local colors are abundant which depict rich cultural tomes of home cooked meals, childhood games, street foods, household help, disciplinary practices, common sense remedies for ailments, and family traditions. Enriched by the maxims of their Mama and Papa, Lydia and her siblings venture through their studies and their lives buoyed up by a firm resolve to reach for their dreams. Empowered by the support of home with its good food and good cheer, the children felt not pressure but a gentle yet firm push towards their various ends and goals. Training to be responsible early in life goes a long way towards shaping up the person one eventually becomes. This was instilled early on in the children of Mariano and Sion. The siblings, although vastly different in temperaments and aptitudes, never the less experience the cohesiveness of family and grow up with a strong sense of it. Growing up has its ups and downs, the reader would be amused to witness the unique manner Aling Sion gives out her particular style of discipline. Even here, the humor that attends such sessions does not escape the onlooker. This book is unique in that it is not saddled by the heavy burden of ancestral history that haunts generations but prefers to look at family life events with neutral eyes and only later to view them within the vaster totality of life. Seen from this vantage point, the seemingly separate and independent series of events never fail to bring one back again and again to the core theme of purpose and goal which Mariano and Sion have managed to successfully bring across to all their children....that life carries hope and limitless possibilities.....and education is the key to all of it. 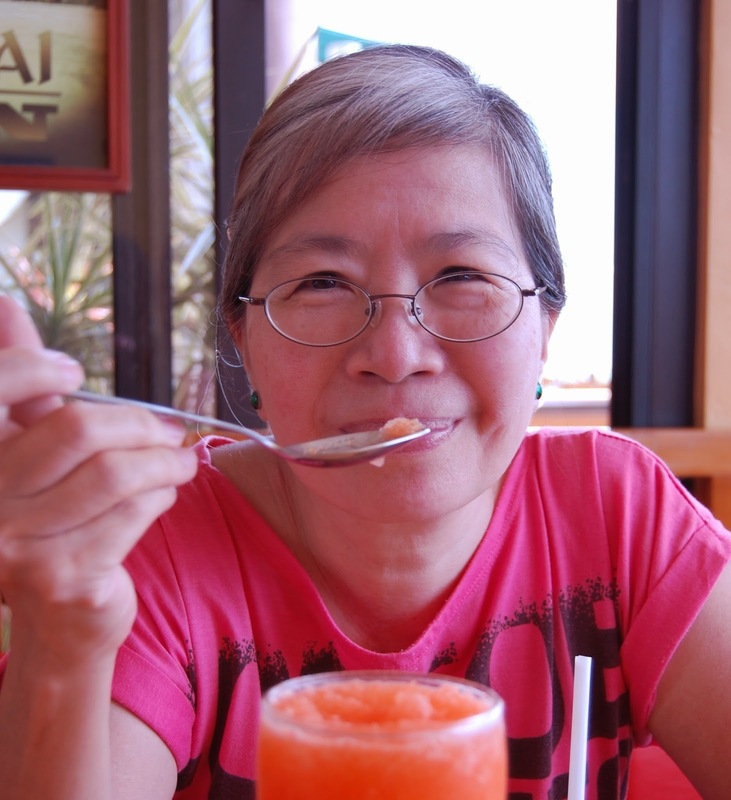 The much treasured recipes of Aling Sion are given a treatment like no other. And I think Mama would be pleased to share them with those who are interested. Lydia assures you that you would not be disappointed. And for those of you who are curious how we managed to eat chicken at all when we couldn't buy them already dressed, you would be happy to realize how lucky you all are now because the process was not easy at all. And you might not believe it if I tell you that school is enjoyable. But it is. Find out how our parents honed that enthusiasm in us, and in doing so, enabled us to excel in our studies. The lives of Mariano and Sion came to a full completion surrounded by family. As they lived, so they died....surrounded by family. This memoir celebrates them. Join Lydia as she time travels to the fifties and sixties when big families were the norm, living was simple and uncomplicated, marriages last, and people’s dreams do indeed come true. Grab a chair and join her family as they partake of meals lovingly prepared and personally cooked by a mom who started married life totally ignorant of the basics of cooking and emerged one of the best cooks of her generation. Walk the insides of a wet market in Manila’s Chinatown and be amazed at how people bought and sold produce without plastic. It can be done and they did it. Learn basic kitchen skills in a time before the advent of dressed chickens and squeaky clean air-conditioned supermarkets. Be among the privileged ones to get hold of Mama’s heirloom recipes and feel free to add them to your own repertoire of treasured dishes. Marvel at the vast array of exquisite dishes in a Chinese lauriat that brings out the freshest and the finest a culinary master can offer, and how this family celebrated because of a father who believed that “tsia si hok” eating is prosperity. Discover the timeless maxims that helped shape a whole generation and kept them grounded. Take a front row seat to see how children of Lydia’s generation took to their studies and gather hints on how to raise children who enjoy going to school and turn out more than well. And most of all see how food acts as the binding gel of childhood, camaraderie, community, a LAURIAT, truly A CELEBRATION OF FAMILY. 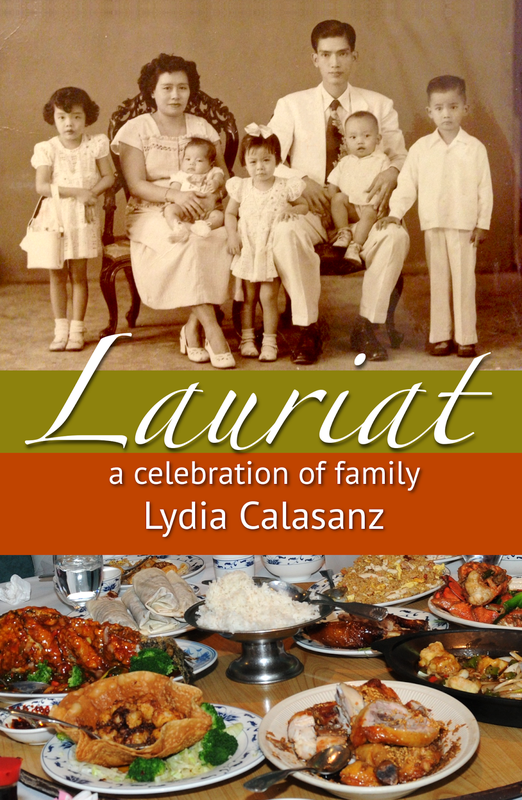 Lydia Calasanz discovers that revisiting one’s past offers a privileged view unlike any other. One is at a vantage point where the seemingly mundane happenings in life literally explode to expose the hidden gifts they have been carrying all along. Being part of a big family carries its own advantage of discovering the sameness in diversity – the driving force and purpose that defines character – and the eyes with which to see these precious gems. This is her first book. Lydia has two daughters and lives with her husband in the State of Washington.